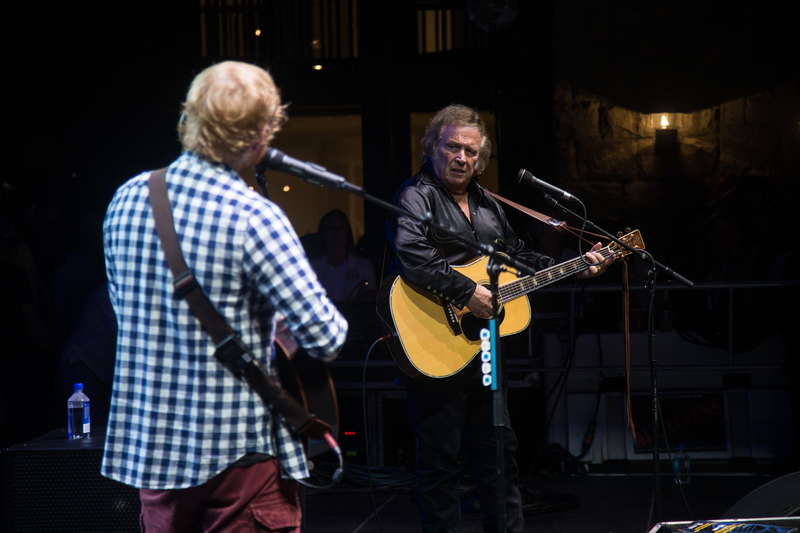 DON McLEAN JOINS ED SHEERAN, ROGER DALTREY, VAN MORRISON, AND MORE FOR CHARITY FUNDRAISER; PERFORMS HIS CLASSIC ‘VINCENT’ WITH SHEERAN | 2911 Enterprises, Inc.
PACIFIC PALISADES, Calif. – Legendary American singer, songwriter and performer Don McLean recently helped raise funds for Teen Cancer America (TCA) and UCLA Health. At the Backyard Concert 2018, McLean joined Rock and Roll Hall of Famers Van Morrison and Roger Daltrey, as well as GRAMMY Award winner Ed Sheeran and others for a once-in-a-generation private concert and live auction. During the concert Don McLean joined Sheeran for a special duet performance of his hit “Vincent”. The invite-only event, the fifth in a series that began a decade ago to raise awareness and funds for UCLA Health’s Autism program, launched the Daltrey-Townshend Teen and Young Adult Cancer Program at UCLA and spearheaded the establishment of Teen Cancer America. Judd Apatow served as Master of Ceremonies for the evening and Howie Mandel as auctioneer for the live auction of a rare collection of music memorabilia and art that was auctioned off throughout the evening. Included in the auction lot was a guitar donated by The Buddy Holly Educational Foundation that experts are saying may be the most valuable ever built for a charity event. The handcrafted guitar, inspired by the Holly classic song, “Learning The Game,” is signed by 75 of the greatest living musicians including Eric Clapton, Robert Plant, Brian May, Bruce Springsteen, Don McLean, Donovan, Brian Wilson, Keith Richards, Dion, Peter Frampton, Graham Nash, Don Everly and Elvis Costello, just to name a few. Peter Bradley Jr. of The Buddy Holly Educational Foundation has spent the last 18 months traveling the world capturing the signatures and stories about how Holly inspired other artists, in preparation for donating the guitar to Teen Cancer America as part of a newly established partnership between the two organizations. Other auction items included a mechanically and electrically refurbished Bally Pinball Wizard Machine built in 1975 to coincide with the release of the movie/rock opera “Tommy.” It was autographed for the event by most of the stars of the film, including Daltrey, Townsend, Elton John, Tina Turner, Jack Nicholson, and Ann-Margret. Additional auction items included a first off the production line, limited edition The Who motorized scooter and high-value art from famed contemporary street-artist RETNA. The auction was being conducted live, and online at www.ha.com, by Heritage Auctions. The first four Backyard Concert events raised close to $10 million, with event expenses totaling less than 10 percent of the funds raised. Friday’s concert and auction raised over $3.5 Million for the charities. Every hour another 13-25 year old is diagnosed with cancer in America. Teen Cancer America transforms the lives for this under-served patient population by working with our country’s leading cancer treatment and research centers. They create specialized clinical care programs, offer therapeutic experiences and provide access to individualized support and resources. This completely unique organization works with the leading healthcare institutions to build state-of-the-art Teen and Young Adult “Social Zones” for both in-patient and out-patient treatment settings. The work of Teen Cancer America has impacted over 5,000 young people and their families nationwide during the last six years. For more information, visit TeenCancerAmerica.org. AUG 23 Vilar Performing Arts Center / Beaver Creek, Colo.
AUG 24 Strings Music Pavilion / Steamboat Springs, Colo.
SEPT 08 NYCB Theater/ Westbury, N.Y.
SEPT 22 Tupelo Music Hall / Derry, N.H.
NOV 15 The Wilbur / Boston, Mass. NOV 16 TBA / Rutland, Vt.
DEC 07 Avalaon Theater/ Easton, Md. JAN 15 Yoshi’s Oakland / Oakland, Calif.